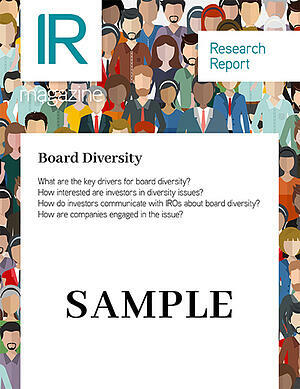 Based on responses from more than 650 IR professionals and more than 200 members of the investment community, Board Diversity is an analysis of how investors and IROs relate to the subject of diversity at board level. The report breaks down the data by region, market cap size and job title. What are the key drivers for board diversity? How interested are investors in diversity issues? How do investors communicate with IROs about board diversity? How are companies engaged in the issue? To access the full report, plus all our reports throughout the year and lots more great IR content, you'll require a subscription to our IR Advanced tier.